No word on improvements to the port. 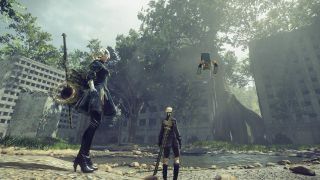 Nier Automata: Game of the YoRHa Edition is coming to Steam in February, Square Enix announced today. We’ve been expecting the announcement ever since it popped up on the ESRB website a few weeks ago. The Game of the YoRHa Edition will come with the 3C3C1D119440927 expansion, 6 pod designs (Grimoire Weiss Pod, Retro Grey Pod Skin, Retro Red Pod Skin and Cardboard Pod Skin), an accessory and two wallpapers. There’s no word, unfortunately, on any fixes or improvements to the disappointing PC port. It launched in 2017 and hasn’t received any patches since, aside from a DLC update. Modders ended up getting it in good shape, however, and despite the quality of the port, it remains an excellent Platinum action romp. Check out Andy's Nier: Automata review. Nier Automata: Game of the YoRHa Edition is due out on February 26.